The Wuji Gong form is the essence of cultivation. It is a true and pure Zen form for the promotion of health and spiritual development. Its practice is simple and natural, its theory profound. Wujigong practice activates our innate healing abilities, promoting our physical, mental, and emotional health. It dissipates illness, restores health, and extends life span. We are the patient, we are the doctor, and the prescription comes from within us. This method embodies the ultimate goal of all qigong. It trains the mind to allow the qi to go where it is needed. It is both the simplest and most profound method of qigong. Wuji Gong practice consists of two parts. The first part is done in a Taiji state of mind, where the conscious mind dictates the movements. These pre-determined movements are called forms. 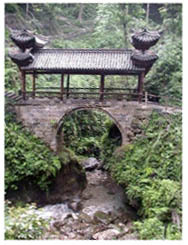 The second and principal part of the practice is in the Wuji state. (Wuji means No Limits). Here, the mind is in a clear and empty state. The conscious brain is quiescent and does not dictate the movements of the body. The innate knowledge within us dictates the movements that our body needs to balance and heal itself. Wuji Gong practice starts in the unordered energy of pre-birth, before we were formed. It proceeds through the unity of the yang of heaven and the yin of earth to bring about our transformation into human form. It then leads us back to the unordered energy of pre-birth where all is possible. The main practice is in the realm of all possibilities, the Wuji state, the state of No Limits. Wuji is the empty state of one's being when unified with the universe. This state is the stepping stone to entering the gateway of Zen, which facilitates the spiritual experience of self-realization and enlightenment, our re-unification with the source. Emei Sacred Healing Sounds harmonize the vibrations of your organs. Everyone, healthy and sick, can benefit from practicing them. Also, people who do not have time or space to practice Qigong, who are under too much pressure at work and in their daily lives will find this breathing and sound exercise accessible. The vital organs of the human body are always vibrating their own frequencies, or sounds. The sound of the heart is like the sound of a fire burning; the sound of the lungs is like the sound of metal hitting on metal; the sound of the liver is like wood knocking on wood; the sound of the spleen is like stone knocking on stone; and the sound of the kidneys is like the sound of a stream flowing. If we could record the sounds of the vital organs, they would sound like the beautiful music of life. These are the natural sounds and rhythms within the universe of human body. When the human body is healthy, the loud, sonorous, low, deep and reverberating vibrations of the cells of the vital organs are harmonious, with regular patterns, and are full of rhythms. The harmonic sounds of the vital organs change when one's physiological or psychological state changes. These sounds are like a concert: If some of the instruments are out of tune, due to illness and disharmony, the originally harmonic music will suffer changes in frequency, musicality and timbre. 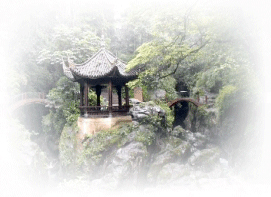 The Emei Sacred Healing Sounds are a centuries-old inheritance that has been passed down by Emei Qigong lineage holders. They help restore the organs to their true and correct vibrations and sounds. Emei Qigong empowered objects, which have been infused with some 5,000 special symbols and mantras, emit positive qi and absorb, neutralize and eliminate negative qi. They are powerful healing tools. They emit positive , healthy energies and are used to dispel illness, neutralize harmful Qi; eliminate or reduce pain, inflammation and stasis; circulate blood and Qi; adjust fengshui; increase wisdom, and more. The Level I book, "The Healing Arts of Emei Qigong," describes the way that all things in nature release energy information. It also lists substances such as jade, diamonds, crystal, gold, silver, and a few more, that release superior energy. Even though these substances release superior energy, limiting yourself to using them for healing is insufficient. Doing this produces only one effect, it gives off superior energy, whereas Qi Empowered objects possess a three-dimensional healing method. In order to strengthen the power of original substances that are already superior in energy, we further empower them. All Emei Qigong Empowered Objects are empowered by Grandmaster Fu and a monastery of monks with extraordinary energy through 49 days of exposing them to nearly 5,000 special symbols and mantras that effectively mobilize universal energy. This transforms the single function into a multi-function that produces a swift effect. If we combine several objects with high energy and use them simultaneously, the healing power is magnified even further. High-energy information objects are a medium for healing oneself and others. The biggest difference between these tools and those used in other healing methods is that empowered objects are highly capable of integrating with energy and spirit. Therefore, the power behind them and the thinking process employed when using them differs from those associated with traditional medical treatment tools. It would be incorrect to simply treat these objects as ordinary tools, just as it would be incorrect to think of a cell phone as just a piece of plastic. The empowerment, the special symbols and mantras that mobilize universal energy may be likened to the micro-chips embedded in a cell phone to differentiate it from a simple piece of plastic. Using empowered objects for healing have elements of psychology and metapsychology . However, we must realize that this qi information healing method contains elements that go beyond suggestion and hypnosis. You don't need any special techniques to use qi information healing as long as you know its theory and operational method. This is unlike other healing methods that require professional training to understand and are useful only for treating others. Whether you are using the qi information healing method to heal yourself or others, you only need to follow the requirements and get into the balanced state of mindlessness and thoughtlessness. The empowered jade has the pre-birth and post-birth energies bestowed by the universe as its foundation. It is further empowered by Grandmaster Fu and a monastery of monks , with extraordinary energy through 49 days of exposing it to nearly 5,000 special symbols and mantras. Consequently, the empowered jade is a tremendously powerful object with exceptional efficacy and a wide range of valuable applications. As with all high quality materials, jade absorbs and releases high-quality energy, so jade benefits everyone around it. 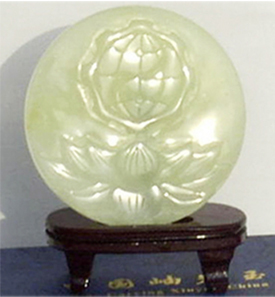 The difference between the empowered jade and natural jade is that, in addition to its ordinary ability to absorb and release high-quality qi, empowered jade can also absorb negative and evil energy and neutralize it, rendering it harmless. Empowered jades sometimes turn color in spots after doing serious or constant healing for severe illnesses. This is because the empowered jade has absorbed and is holding a great deal of sick energy and has not yet had sufficient time to neutralize it. If you let the jade rest,it will clear itself. There is no need to clean empowered objects. They are all self-cleansing. Like the empowered jade, the blanket is also empowered with extraordinary energy through 49 days of exposing it to nearly 5,000 special symbols and mantras that are effective methods to mobilize universal energy. In addition, balanced yin-yang magnetic flakes in the empowered blanket generate a magnetic field. Consequently, it continuously absorbs positive energy from heaven and earth and at the same time emits its miraculous energy. It also absorbs and neutralizes evil and sick energies. both at the top left and right. The symbol "He Tu," representing the pre-birth energy of the universe, is on the left, second row. The symbol "Luo Shu," representing the post-birth energies of yin-yang and the five elements of the universe, is on the right. The pre-birth eight trigrams, symbolizing the status of the pre-birth movements of the universe, are on the left, third row. On the right is the big dipper, representing the changes of all things on earth. A Daoist Tianzun secret talisman for dispelling all evil forces is on the left, fourth row. The Milky Way, representing the countless planetary systems in the universe, is on the right.. 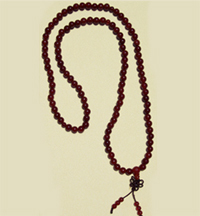 The Empowered necklace mala beads consist of 108 red carnelian beads. The semi-precious carnelian is classified as red jade in Chinese qigong society. Like the jade and blanket, the mala beads have gone through 49 days of There are long and short strands of empowered beads. This bead is the pre-birth energy and it also represents Other than this bead, the long strand has 108 beads (some have three additional smaller beads that divide the strand into equal quadrants) and the short strand has 18 beads. They contain 108 and 18 different levels of post-birth energy information respectively. The long strand of empowered beads is usually worn around the neck or wrapped a few times around the wrist or ankle. They are red carnelian beads. The semi-precious carnelian is classified as red jade in Chinese gemnology. It has the intrinsic power to realease high quality energy and it is empowered. The short strand of empowered beads is more suitably worn on the wrist or ankle. These hard beads are from the root of the Boddhi tree. Like the other empowered objects, the empowered beads can absorb and release positive energy. They can also absorb and neutralize negative and sick energies. Sometimes one or a few beads break without any apparent reason. Upon further investigation, it's easy to notice the connection of catastrophic events with the breaking of the beads. This is because the beads, in reducing the negative effect of the event, have absorbed powerful negative energy and diverted harm or tragedy from the wearer. Essentially, this healing method is dependent on the fact that all things possess qi information. A cultivated healer naturally has the ability to interact and communicate with universal energy. The healer is capable of tapping into the energy exchange between heaven and earth and directing this towards humanity. There is also a component of psychological suggestion in meta-acupuncture although an unconscious recipient will definitely benefit. Under the guidance of the Meta-Acupuncture Healing Method, the person who is seeking healing will momentarily reach the high level of a tranquil state. This invokes the same self-healing and self-restoring effect as Qigong practice. Also, when the person is in the tranquil state, his or her mind is steady and the energy and blood are in a balanced state. The open system of the whole body has a high sensitivity, hence the ability to communicate naturally with universal energy is greatly enhanced. When the person is in this state, universal energy can do the most good. 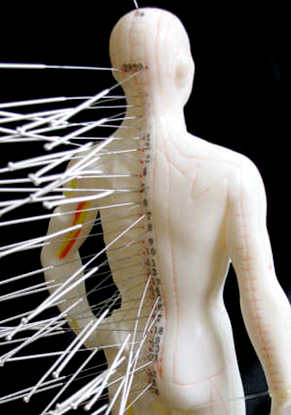 This makes meta-acupuncture healing a grand method that combines universal energy and the openness to psychological suggestion allows the healing. 1. 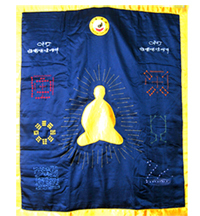 The mantra has a specific nature of command and it easily mobilizes universal energy. 2. The energy that the mantra mobilizes is much stronger than the energy that comes through any other methods. 3. The mantra has the effect of resisting the intrusion of bad-quality energy entities, including disease energy. 4. The mantra protects the healer's positive energy from leaking out. 5. During a mantra healing session while the healer is healing someone, the universal energy mobilized by the mantra also adjusts the healer's imbalanced energy at the same time. This method of healing others and adjusting oneself at the same time is a grand method that merges healing and cultivation into one. To use the universal mantra to communicate and mobilize the universal energy to heal, one has to recite the mantra for at least 300,000 times before it has a healing effect, it's not simply a matter of having seen the mantra in a book or hearing about it from someone. However, if you have had the empowerment from within Emei Qigong, you would have already developed some latent ability and only need to familiarize yourself with the mantra in order to use it right away.